100% organic cotton bag, made without pesticides to not harm the planet. A true eco bag which supports communities in developing countries. This isn't like those cheap old bags that are given away free - this bag is sturdy, well made and does good. What else do you want in a bag? A bag with soul that's what. Available with purple or pink writing, choose which colour you want using the options available. I’m trying to be healthy but need a daily energy boost! I’m trying to be healthy but need a daily energy boost! These are absolutely gorgeous - I ordered the chocolate bomb flavour and they are a really good size, not too sweet and a little spicy - really nice. I’m just ordering a larger pick and mix bumper box to try the zest for life and lemon pop - really good customer service as well - I just sent a question online to Kitchen & Soul and received a reply straight away - and it’s Sunday! Thank You! These are delicious. Delicate flavours and a moreish texture. I will be ordering again . Ordered these as I no longer eat the usual processed foods and realised I had nothing Christmassy to eat on the big day when at my sisters. Nadra was very helpful, even sending my order 1st class to be sure I got the goodies in time. Tried one with my morning coffee and they really are delicious. Very nice texture and fabulous flavour. Miss mince pies no more! Best vegan balls I've ever had, perfect to eat whenever! They really do have souls! love the packaging! These balls have soul! Arrived in a lovely wee box. Good range of flavours and textures. Perfect for keeping me going on the way to work after a workout. One is just enough to give me a good boost but it's hard to resist eating them both at once! Much more moist and full of flavour than any other similar products on the market. I'm usually a chocolate and sweets girl but am a complete convert. Good mood food is 100% accurate. Good mood food is 100% accurate... I often start work at 08:00 and don't end up getting a break until 15:00 & these delicious balls of goodness keep me going without that awful 'hangover' you get from less natural & nutritious products. And I find the cacao balls the best hit when you're craving chocolate - amazing!!! 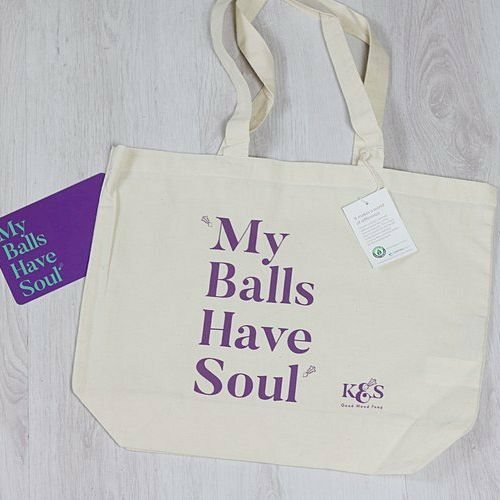 These balls truly have soul and I can't wait to see what comes next from Kitchen & Soul...genius!!!!!! Natural energy balls - creating positive mental wellbeing through food.